Loot Anime February 2019 theme is POWERS. It included Alita Battle Angel, Dragon Ball, and more! Here’s the review + coupon! Loot Anime January 2019 theme is DANGEROUS. It included Alita Battle Angel, Naruto, and more! Here’s the review + coupon! 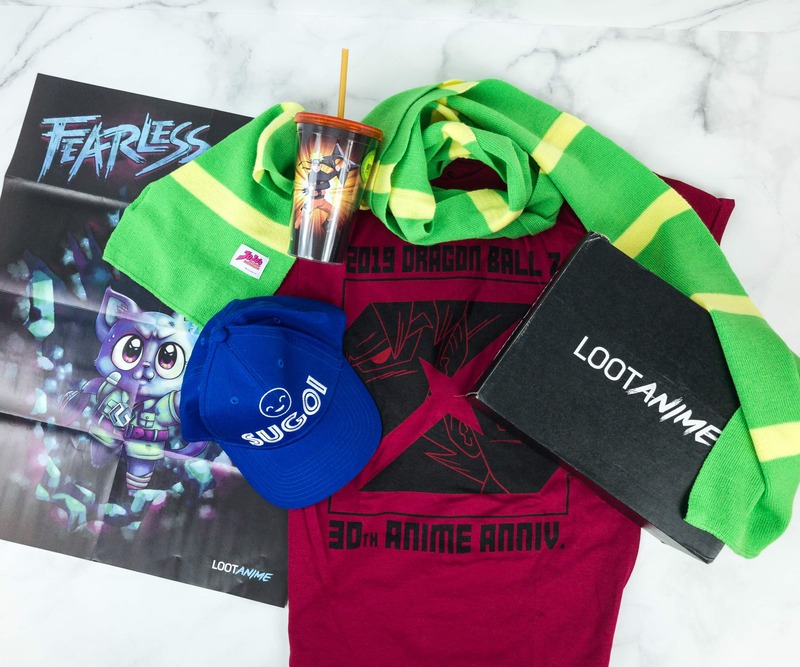 Loot Anime December 2018 theme is FEARLESS. It included Dragon Ball Z, Naruto, and more! Here’s the review + coupon! Loot Anime November 2018 theme is SEARCH. It included Hunter X Hunter, Death Note, Voltron, and more! Here’s the review + coupon! Loot Anime October 2018 theme is TRANSFORM. It included Dragon Ball Z, My Hero Academia, Robotech, and more! Here’s the review + coupon! 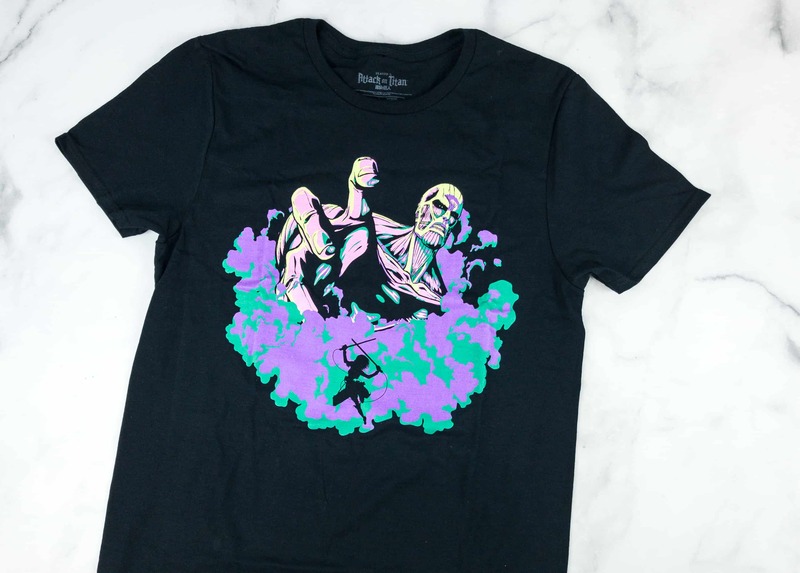 The delayed Attack On Titan Shirt from Loot Anime July 2018 box is finally here! Here’s the review! 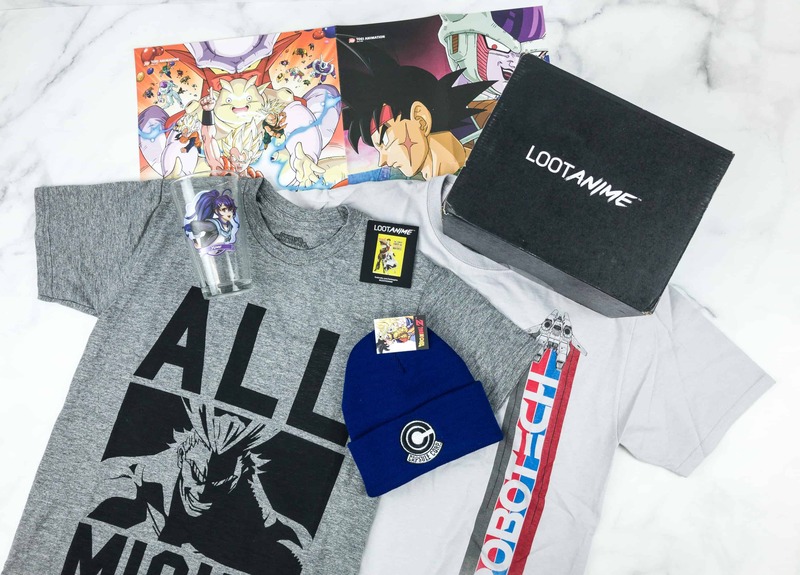 Loot Anime September 2018 theme is FIERCE. It included One Punch Man, Aggretsuko, Cells at Work, and more! Here’s the review + coupon! Loot Anime August 2018 theme is DEFEND. It included Rising of the Shield Hero, Space Dandy, Evangelion, and more! Here’s the review + coupon! Loot Anime June 2018 theme is SQUAD. It included Attack on Titan, My Hero Academia, and more! Here’s the review + coupon! Loot Anime June 2018 theme is ACTION. It included Naruto Shippuden, Claymore, Alita: Battle Angel, and more! Here’s the review + coupon! Loot Anime May 2018 theme is ALTERNATE UNIVERSE. It included Fooly Cooly, Cells At Work, and more! Here’s the review + coupon! 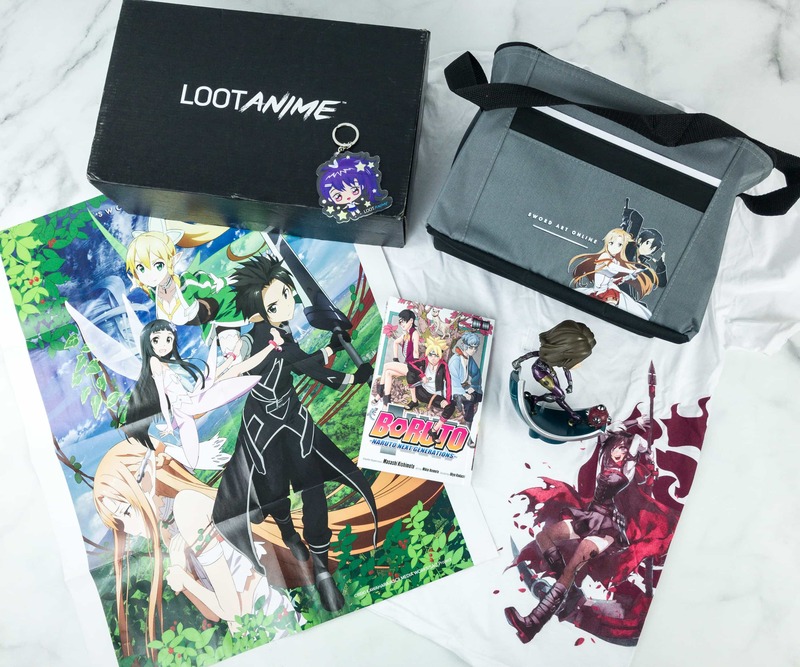 Loot Anime April 2018 theme is QUIRKY! It included Pikotaro, Delicious in Dungeon, Pop Team Epic, and more! Here’s our review + coupon! Loot Anime March 2018 theme is BRAVE! It included Neon Genesis Evangelion, Assassination Classroom, Fairy Tail, and more! Check out our review + coupons! Loot Anime February 2018 theme is TECH! It included Astroboy, Psycho Pass, and more! Check out our review + coupons! Loot Anime January 2018 theme is GAME ON! It included a Shadow the Hedgehog figure, a manga, and more! Here’s our review + coupons! Loot Anime December 2017 theme is UNDERDOG! It included a Banpresto figure, a Justice League manga + more! See the review & grab coupons! 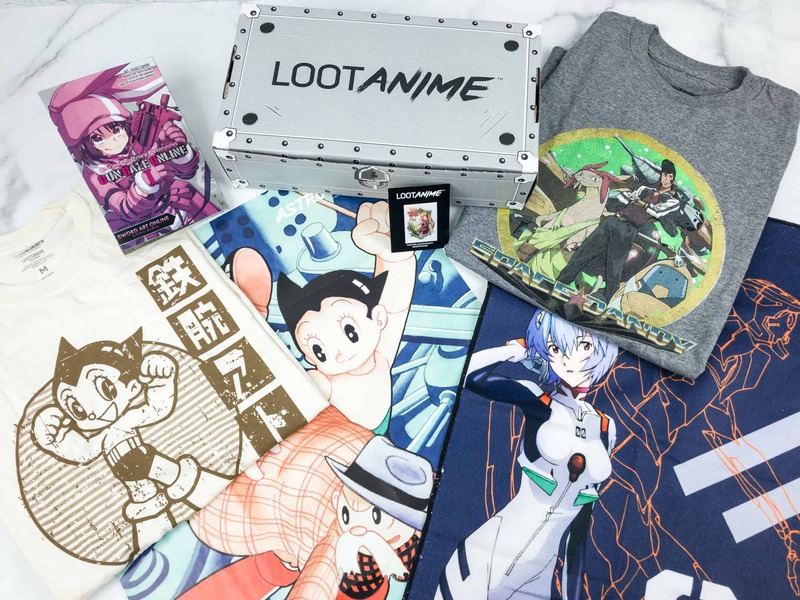 Loot Anime November 2017 theme was BESTIES! See the review + coupons! Mushishi, JoJo’s Bizarre Adventure, and more! 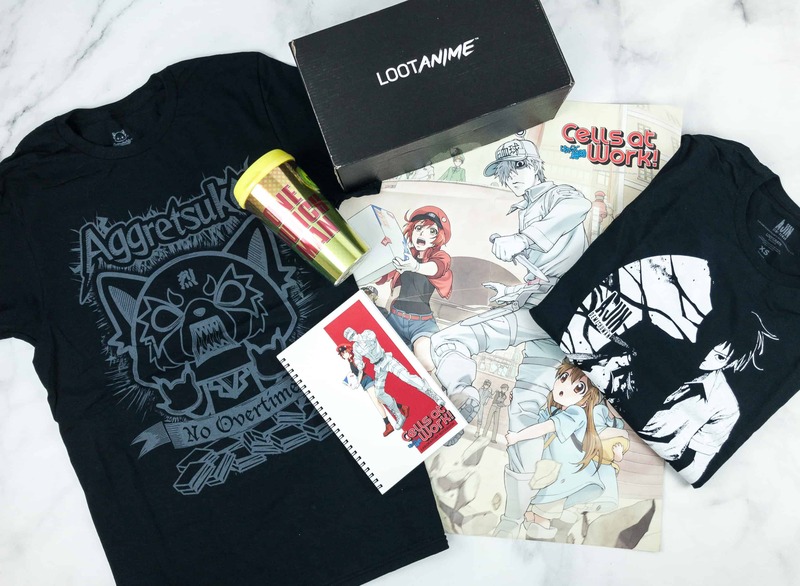 Loot Anime October 2017 was all about GODS AND SPIRITS – here’s the review + coupons! 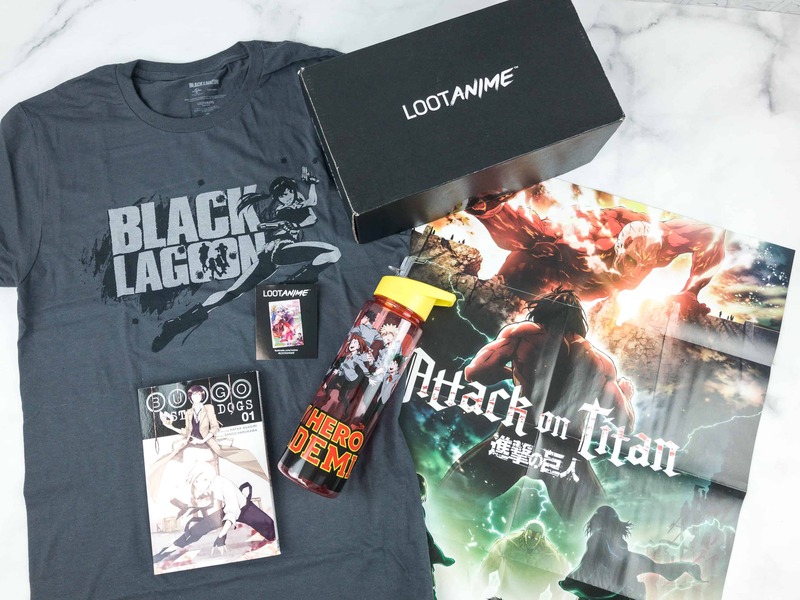 Loot Anime September 2017 theme is SURVIVE. We got a Black Clover manga, a Naruto figure, and more! Here’s the review + coupon code! Loot Anime August 2017 theme is WORK FOR IT. We received a Soul Eater manga, a Gintama figure, and more! Here’s the review + coupon code! Loot Anime July 2017 theme is ACTION COMEDY. We received items from One Punch Man, Trigun, and more! Check out the review for details! Voltron pin, Blame! t-shirt + more were included in our Loot Anime June 2017 box. The theme was RISE UP! See the review for details! Death Note, Parasyte, and more! 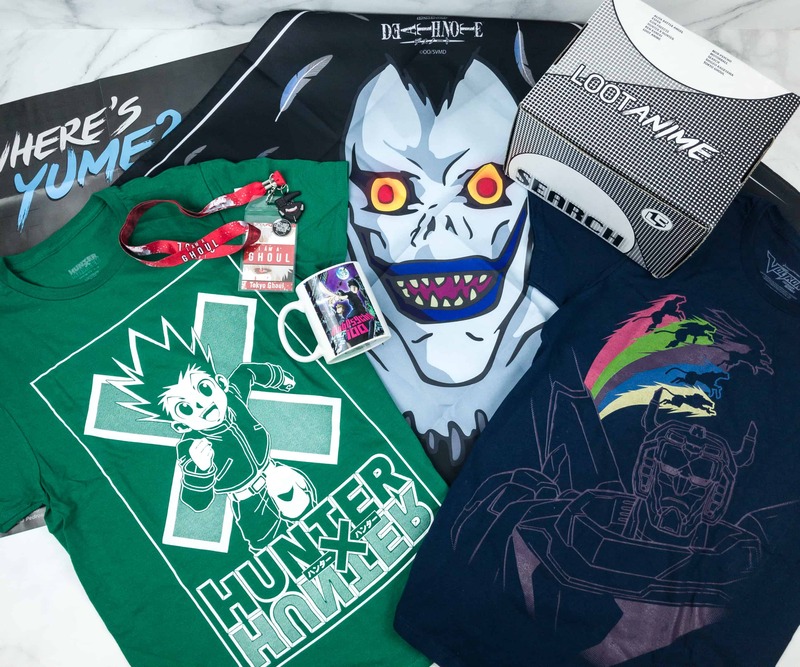 Loot Anime May 2017 was all about unnatural beings – here’s the review + coupons! Loot Anime April 2017 had the theme HUMANITY and included Attack on Titan items. Read the review for details + coupons! Loot Anime March 2017 was all about the FUTURE. It included a shirt, a flash drive + more! Check the review for details! Loot Anime February 2017 theme was TOGETHER. It included items from One Piece, Mr. Osomatsu, and more! Read the review for details! 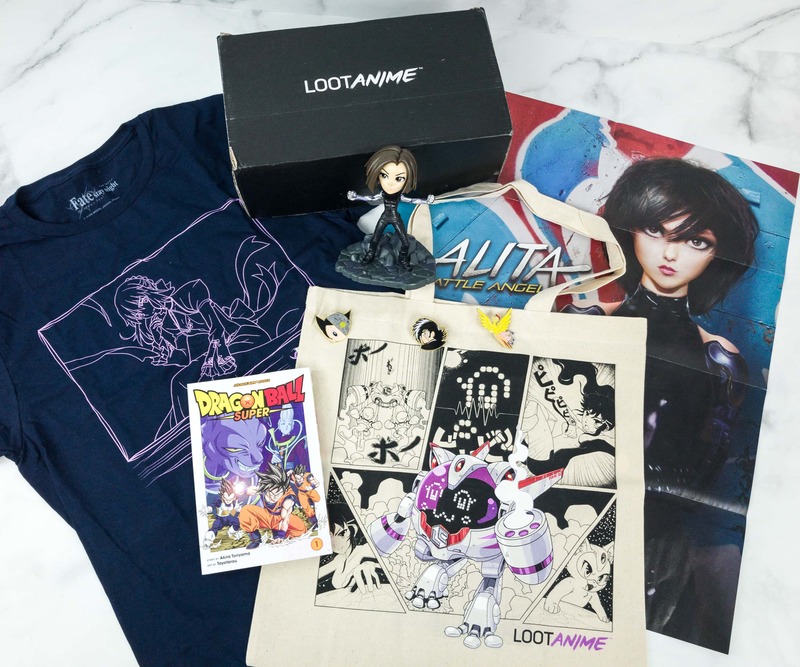 DIMENSION was the theme for January 2017 Loot Anime box had! It included items from Sword Art Online, Re:Zero, and more – see the review for details! The December 2016 Loot Anime box had the theme “GALAXY!” See our review to see Sailor Moon, Cowboy Bebop goodies & more + coupon!!! This box is still available! The November 2016 Loot Anime box had the theme “BLADE!” See our review and use our coupon code to get 10% off any subscription plan! See our review of October 2016 Loot Anime box with the theme “DELICIOUS” + coupons! See our review of the DEMI-HUMANAugust 2016 Loot Anime box!